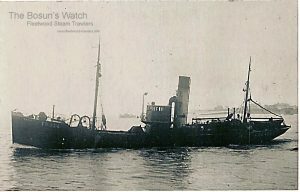 16.3.1915: Launched by Smith’s Dock Co Ltd, South Bank-on-Tees, Middlesbrough (Yd.No.608) for The “Wyre” Steam Trawling Co Ltd, Fleetwood as CRAIK. 17.4.1915: Registered at Fleetwood (FD134). 4.1915: Completed (Magnus B. J. Wedum, managers). Requisitioned from the builders for war service as a minesweeper (1-12pdr) (Ad.No.1471). 26.11.1932: Homeward from fishing grounds in heavy seas and poor visibility, stranded 4 miles N of Feolin Ferry, Jura; crew of eleven rescued by Craighouse Life Saving Apparatus Company. 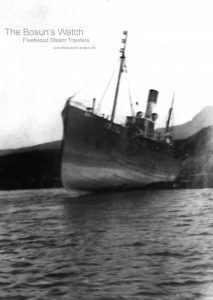 8.12.1932: Refloated by salvage steamer and anchored Port Askaig. Repaired and returned to service. 1935: Sold to A. Robertson, Aberdeen. 1.5.1935: Registered at Aberdeen (A300). 1935: Sold to Andrew Robertson & R. C. Kelman, Aberdeen (Andrew Robertson managing owner). 26.8.1939: Requisitioned for war service on examination service (Hire rate £60.4.6d/month). Based Aberdeen. 1945: Sold to R. C. Kelman, Aberdeen (A. Hay, manager). 1945: Sold to Devanha Fishing Co Ltd, Aberdeen (William Wood, manager). 1948: Registered at Aberdeen as GILMAR (A300). 29.6.1957: Went to assistance of CARENCY (A129) (Sk. David Wood) which in thick fog had stranded at Greenigoe one mile north of Wick. Connected and moved the vessel about 20 ft. Wick lifeboat (Cox. Neil Stewart), which had been standing by for fourteen hours, took off crew of thirteen and two hours later vessel slipped off rocks, rolled over and sank. 1960: Registered at Aberdeen as GILMAR II (A300) to free name for newbuilding. 1960: Sold to BISCO and allocated to James A. White & Co Ltd, St. Davids, Fife for breaking up. 7.12.1960: Delivered St. Davids from Aberdeen under own power. 17/05/2012: Page published. 7 updates since then. 28/05/2017: Removed FMHT watermarks from images. This entry was posted in Steam Trawlers, Steamers (Picture) and tagged Wyre on May 17, 2012 by Fred Smith. 3.4.1916: Launched by Smith’s Dock Co Ltd, South Bank-on-Tees, Middlesbrough (Yd.No.634) for The “Wyre” Steam Trawling Co Ltd, Fleetwood as BURNLEY. 5.1916: Completed (John N. Ward, manager). 11.5.1916: Registered at Fleetwood (FD242). Requisitioned direct from the builders and fitted out as a minesweeper (1-12pdr) (Ad.No.3277). Attached to Harwich Auxiliary Patrol. 26.9.1916: Magnus B. J. Wedum appointed manager. 25.11.1916: While sweeping off Orford Ness, mined in position 52.4.45N 1.42.0E. 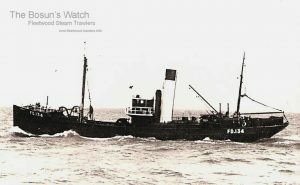 27.11.1916: HMTrawler KELVIN (H357)(Ad.No.1974) when off S.I. Gabbard Buoy at about 2.00 pm. recovered body of W. Wetherly, Mate, transferred to HMDrifter ORION II (BF368) (Ad.No.2280) and landed at Harwich. 16/05/2012: Page published. 2 updates since then. 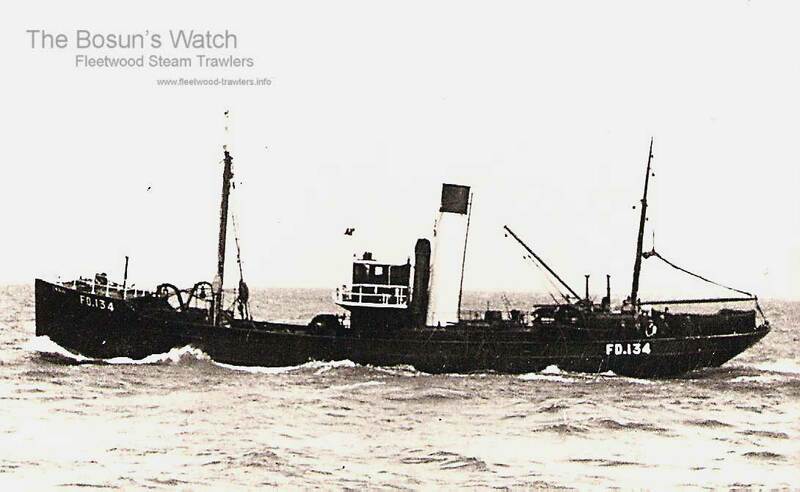 This entry was posted in Lost Vessels, Steam Trawlers and tagged Lost, War Loss, Wyre on May 16, 2012 by Fred Smith. 2.10.1907: Launched by Smith’s Dock Co Ltd North Shields (Yd. No.362) for John Thomas, Milford Haven (managing owner) as BEATRICE. 30.11.1907: Registered at Milford (M212). 13.8.1914: Arrived Devonport for Special Trawler Reserve; when stored to sail for Lowestoft. Based on the Tyne. 1.1915: Arrived Devonport to fit out for Mediterranean as a minesweeper (1-3pdr) (Ad.No.362). 8.3.1915: Sweeping near Yeni Cale, Dardanelles, paired with OKINO (Lieut. Geoffrey T. Whitehouse RNR)(Ad.No.285) (GY4). Leaving area OKINO mined and foundered in two minutes; four survivors including the CO. Damaged by shelling, Ch Eng. William Holland, Milford, suffered head injuries from shrapnel. Operated on and recovered. 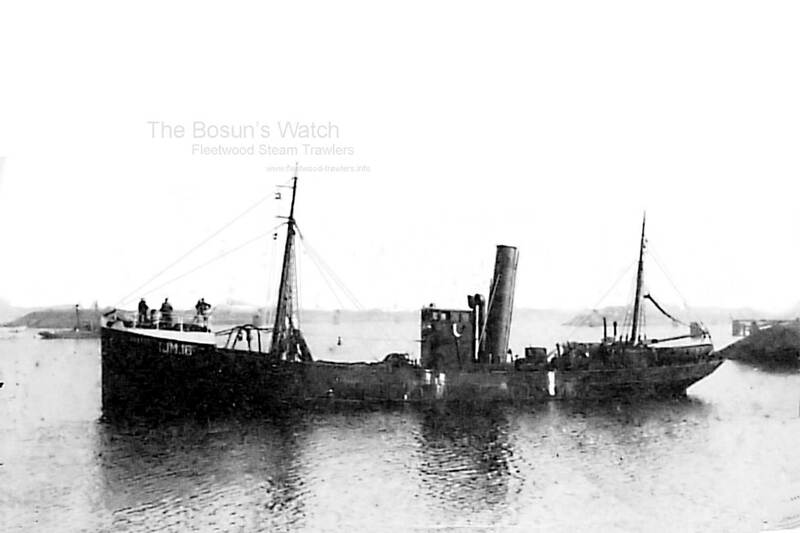 16.10.1917: Sold to The Wyre Steam Trawling Co Ltd Fleetwood (Magnus B. J. Wedum, manager). 14.3.1918: Sold to Walter Harold Beesley, Grimsby (managing owner). 10.4.1918: Registered at Grimsby as BEATRICE (GY1114). 3.1919: Sold to The Middleton Steam Trawling Co Ltd, Hartlepool (Harry Middleton, manager). 4.1919: Registered at Hartlepool (HL16). 1927: Sold to N.V. Maats “Petten”, IJmuiden (L & J Schager, managers). 1927: Registered at IJmuiden as BERGEN (IJM16). By 1930: N.V. Vissch. Maats “Petten”, IJmuiden (L & J Schager, managers). 6.1940: Requisitioned for war service under Dutch Naval Control (P.No.6C). 8.1940: Fitting out at Milford. 9.1940: At Holyhead with M/S Group 66. 11.1941: Group moved to Milford. 1.6.1942: Group moved to Portsmouth under Admiralty control (P.No.FY.932). 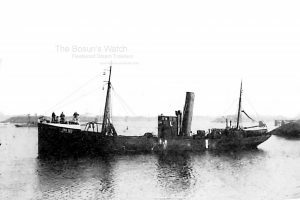 9.1942: At Southampton as a minesweeper fitting out with oropesa sweeps. 5.1943: Fitting out as a single line gate vessel. 6.1943: Last recorded, still fitting out. 1945: Laid up in Southampton (did not return to IJmuiden). 25/10/2009: Page published. 3 updates since then. 19/06/2018: Removed FMHT watermark from image. This entry was posted in Steam Trawlers, Steamers (Picture) and tagged Wyre on October 25, 2009 by Fred Smith. 7.11.1900: Launched by Smith’s Dock Co Ltd, North Shields (Yd.No.643) for The “Wyre” Steam Trawling Co Ltd (64/64), Fleetwood as RIBBLE. 30.11.1900: Registered at Fleetwood (FD198). 4.12.1900: Completed. Richard C. Ward & John N. Ward appointed joint managers. 23.1.1901: Vessel mortgaged (64/64) to The Lancaster Banking Co Ltd, Lancaster at 43/4% interest (A). 14.9.1901: Sailed for the fishing grounds. Mate, Daniel Knight jumped overboard in an attempt to swim ashore. Despite all efforts to rescue him, he drowned. “He had some drink, which is supposed to be the cause of his unreasonableness”. 10.1905: At Bantry, Co. Cork, Sk. Richard Collinson was fined £30 with net forfeited for illegal trawling on 5.9.1905 within the limits of Bantry Bay. 17.5.1906: Sailed Fleetwood for grounds off the west coast of Ireland (Sk. Richard Collinson); nine crew total and two pleasurers. 26.5.1906: At 5.40pm. with a full catch left the fishing grounds and set an easterly course for Fastnet. At 9.40pm skipper left the bridge with the third hand on watch and instructions to call him when the log showed 55 miles run. No order was given regarding lights. At 11.40pm. ran into a bank of fog hanging over the land, but speed was not reduced. As the third hand was about to leave to call the skipper he noticed something looming ahead. The engine was stopped and reversed at full speed but the vessel struck the ground and with way still on her, went over a ledge into water surrounded by rocks and came to rest under the fog station construction site at Clohane Island near Mizen Head, Co. Cork. The vessel was making no water and apart from getting the boat ready nothing further was done until daylight. 27.5.1906: At 3.30am. without having taken any soundings over the ledge, the skipper backed her at full speed to try and clear the ledge. At each attempt she came fast amidships; no attempt was made to lighten her and by 6.00am she had started to make a little water. Shortly after the crew took to the boat, landing in Dunlough Bay and walking to Crookhaven were they arrived in the evening. Telegrams were sent and the paddle tug FLYING SPORTSMAN (187grt/1882) engaged. 29.5.1906: Tug arrived from Queenstown but vessel was under water from aft to the bridge. 15.6.1906: Fleetwood registry closed “Stranded. Total wreck”. 27.6.1906: At the formal investigation held at Liverpool (No.S.228), the Court found that the loss was due to the careless navigation of her master, Richard Collinson and of her third hand, John Stables. The certificate of skipper was suspended for three months and the third hand was strongly censured. 01/05/2009: Page published. 4 updates since then. This entry was posted in Lost Vessels, Steam Trawlers and tagged Lost, Wyre on May 1, 2009 by Fred Smith.